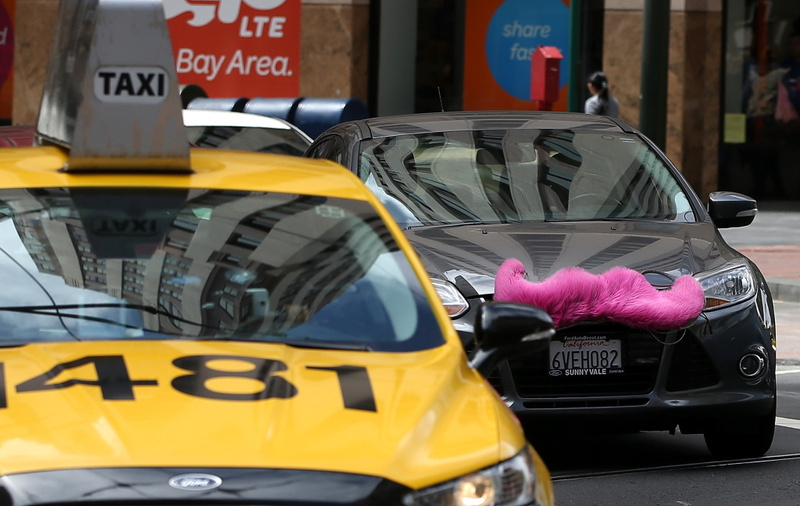 A Lyft car drives next to a taxi on June 12, 2014 in San Francisco, California. The California Public Utilities Commission is cracking down on ride sharing companies like Lyft, Uber and Sidecar by issuing a warning that they could lose their ability to operate within the state if they are caught dropping off or picking up passengers at airports in California. 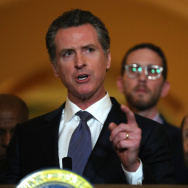 The California Department of Motor Vehicles is backing down from requiring drivers for “e-hail” services like Uber, Lyft, and Sidecar to obtain commercial license plates after a firestorm of criticism. The DMV first brought up the policy in early January, citing a 1935 state law as justification. The financial implications would be enormous. E-hail drivers would need commercial insurance, for example, which is more of a hassle to get, particularly when most drivers are just part-timers. Some analysts say the commercial license plate requirement would be a huge roadblock for the e-hail industry. Should e-hail drivers be required to get commercial licenses? Sunil Paul, CEO of Sidecar, a “e-hail” company founded in San Francisco, Calif.
Uber, Lyft drivers: Employees or independent contractors? Justice, truth and freedom: Brought to you by...science?